North View Fishery at Gedney Hill has been a happy hunting ground for Webb’s AC, but on Sunday it was quite the opposite as many in the field found it tough going in the wind and driving rain. Out in front was Peter Telszewski, who caught on the pole with maggot close in for 25lb 3oz. 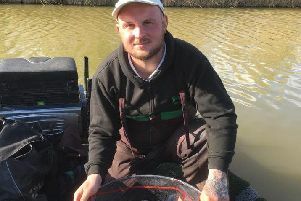 Runner-up John Hill caught on a small feeder for 13lb 3oz, then came Colin Clark with 11lb 5oz. The Ramsey club had two matches recently, both on their club waters and both fished really well. In the Wednesday match at Ramsey St Marys it was Malc Hobbs out in front with 28lb 13oz of roach and rudd taken on the waggler. Frank Bevilacqua came second with 20lb 11oz, and then came Harry Young with 14lb 13oz. If anything, Sunday’s match on the same venue was even better with the top five anglers all weighing in more than 13lb. Top rod in this one was Andrew Wilding. He caught well on the waggler and maggot, but also put a good tench to the scales taken on worm which saw him finish with 19lb 5oz. Harry Young came in second with 15lb 9oz, followed by Jim Broadbent with 13lb 150z and Keith Rayment with 13lb 14oz.